Given that my previous post says there can be no net value at all, I find this claim startling and it should be informative to investigate exactly how this number is arrived at. Bottom line: (i) they calculate the benefit of a hedge captured by the low-C generator, but, (ii) they completely ignore the cost to the taxpayer or ratepayer from providing that hedge. Ignoring (ii), the cost to taxpayer or ratepayer, is obviously the big problem, and we could stop there. But let’s take the bait and go ahead to examine (i), how they calculate the benefit of hedge captured by the low-C generator. 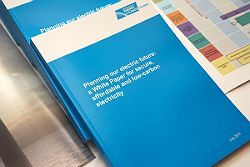 The UK’s Electricity Market Reform (EMR) White Paper suggests that providing low-C generation projects with a hedge of the wholesale electricity price can lower the cost of providing low-C electricity. Can this be? A fairly priced hedge changes both the project’s risk and it’s return. The first order effect of the two is to leave the risk-adjusted cost of the project unchanged. This is commonly known as the M-M Proposition of Hedging. Students of corporate finance are familiar with the Modigliani-Miller irrelevance propositions. Proposition 1 says that the value of a firm is determined by the firm’s cash flow from assets and is independent from its capital structure. The Proposition is often presented to demonstrate the irrelevance of choosing between debt and equity, but the underlying logic is more general than that. The Proposition applies to any choice in the set of contracts used to finance the firm. These include hedges, for hedges are implemented with financial contracts that change the balance sheet of the firm. So, what we call the M-M Proposition of Hedging is simply a corollary to the original M-M Proposition 1. Apple’s cash hoard: how much is too much? 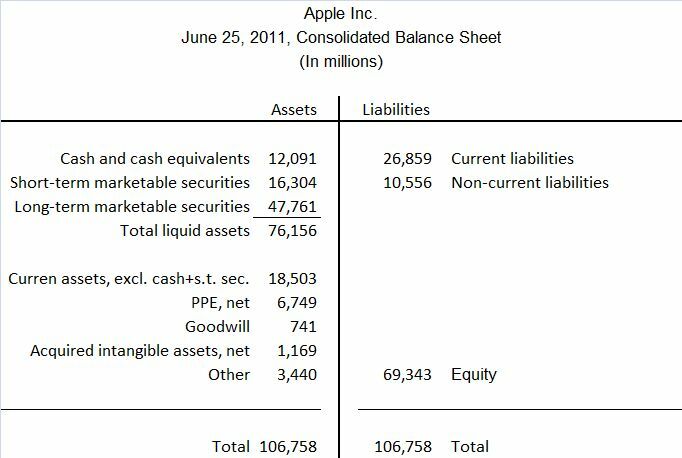 Cash and other liquid securities total $76 billion and represent more than 70% of Apple’s book assets. (ii) nevertheless, investors would prefer the former over the latter. Can (i) and (ii) be true at the same time? No. Not if we are operating in an orthodox model of risk pricing. Not if there are robust capital markets where each risk has a unique price. Not if the principle of value additivity applies — “If we have two streams of cash flow, A and B, then the present value of A+B is equal to the present value of A plus the present value of B.” (Brealey, Myers and Allen, Ch. 17). To examine claims (i) and (ii) more carefully, I constructed the two figures below based on Newbery (2008) which is one of the background papers underpinning the EMR’s White Paper. Similar figures have been used in other academic papers underpinning the EMR’s White Paper. Last week, the Coalition for Derivative End Users filed a new comment letter with bank regulators on the rulemaking for the Dodd-Frank reform of the OTC derivatives markets. The Coalition has taken a lead role in lobbying to expand the end-user exemptions on clearing and margins. One interesting thing about the letter is how it betrays progress in the intellectual debate on the cost of margins. The unorthodox model of risk pricing behind the UK EMR #2: the government as derivatives dealer! The central aspect of the UK government’s proposed Electricity Market Reform (EMR ) with which this series of posts is concerned is the desire to shift all risk from private investors in generation onto public authorities. One example of this is the recommendation that the public authorities get into the risk management business by selling electricity derivatives to low carbon generators. In the EMR these are called Contracts for Differences (CfD). In the finance world they’re called electricity price swaps. The EMR bundles these swaps together with a price premium paid to low carbon generators–the Feed-in Tariff–and so calls the full package a FiT CfD. The figure above is taken from the EMR White Paper and shows how this swap works. The swap has a strike price of £70/MWh shown at the top red line. The black line shows the realized wholesale electricity price. When the wholesale price is below the strike price, the public authority pays the generator the difference, shown in dark green. 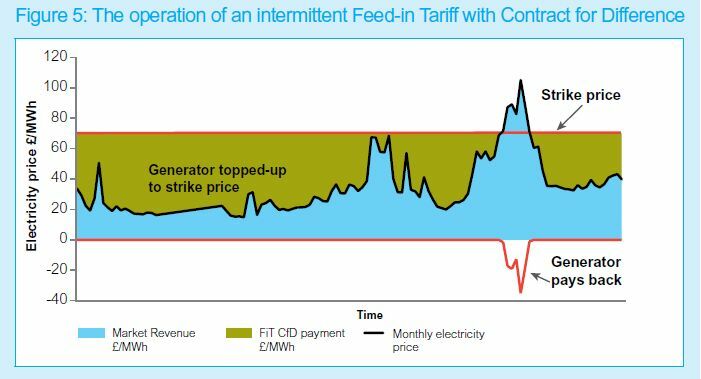 When the wholesale price is above the strike price — which in the diagram happens briefly late in the period shown — the generator pays the public authority the difference. The UK government released its Electricity Market Reform (EMR) White Paper today. One of the central goals is increasing the share of low carbon electricity generation in the UK mix. 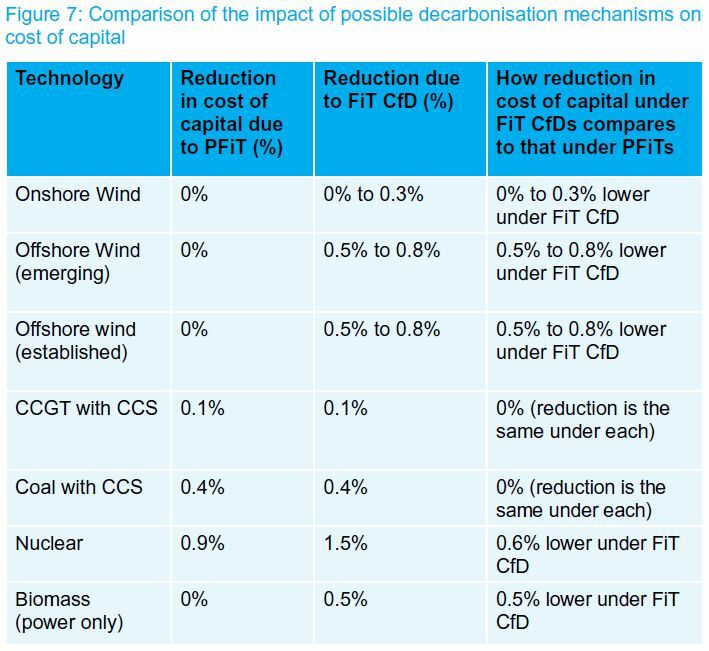 The central premise is that the current price of carbon is too low, but also that a number of key institutional features of the electricity market create additional obstacles to investment in low carbon generation. Risk plays a big role in these additional obstacles. The institutional reforms proposed in the EMR transfer risk from corporate investors to the UK public, either as consumers or as taxpayers. The EMR claims that this risk transfer is beneficial to society. I plan to use a series of posts to scrutinize in detail the EMR’s analysis of risk, investment in generation capacity and the costs and benefits to society. My central complaint is that the EMR’s analysis of the cost of risk is an unorthodox one, completely at odds with modern financial markets theory. It is only by baldly abandoning traditional financial calculus that the EMR is able to produce numbers that show a benefit to society. In fact, the proposed reforms threaten to load society with very costly risk that consumers and taxpayers may later regret. The arguments made in the EMR have been kicking around among UK policy circles for a while, and I discussed the issue at a general level in a 2009 presentation at the London Energy Forum hosted by the London Business School available here. But the publication of the EMR White Paper and supporting documents offer the opportunity to examine the issues in more careful detail. The pressure to produce substantive numbers forces the advocates for these reforms to be more concrete in their analytic tools, and so it is easier to call attention to how the argument is so at odds with modern finance theory. Stay tuned. The Progressive Policy Institute (PPI) just released a Policy Brief by Jason Gold and Anne Kim on “The Risks of Over-Regulating End-User Derivatives”. The piece recycles bad arguments made previously by others, and offers absolutely nothing new. For example, to quantify the potential job losses attributable to requiring margin from end-users, the authors repeat the discredited numbers produced earlier this year in a “study” commissioned by the Business Roundtable–see analysis here, here and here. Maybe that’s the point. Although the earlier work has been discredited, if the numbers are recycled through enough other outlets, then they can be naively quoted in future lobbying work. We’ve already addressed the Brief’s main arguments in previous posts (start here or here), and won’t rehash those points again now. However, one of the central premises of the Brief is a delusion shared by many other commentators on end-users and margins, and it would be useful to take this occasion to puncture that delusion and return the discussion to the real historical facts and sound economic theory underpinning margins and end-users. What is the delusion? It has two parts. Who should bear the risks of cost overruns in the construction of new nuclear power plants: electric ratepayers, the electric utility sponsoring the project, equipment vendors, contractors or others? That’s the question currently being debated at the Georgia Public Service Commission (PSC) in regard to two new nuclear units under construction at the Vogtle site. The PSC staff has proposed a Risk Sharing Mechanism (RSM) that cuts the profit paid to the plants’ sponsor, Georgia Power (Southern Co) in the event of cost overruns.